Raychem HAx mineral insulated (MI) Alloy 825 series heating cables are suitable for use in hazardous areas. They have been designed for use in freeze protection and temperature maintenance applications of pipes, tanks and other equipment. MI heating cables of the HAx-series offer an ideal combination of ruggedness, high temperature withstand capability and corrosion resistance and can therefore be used for a wide variety of heat-tracing applications, in particular for applications with high power requirements and for temperatures exceeding the capabilities of polymer insulated (PI) series heating cables. The heating cables can be used for exposure temperatures of up to 700°C and a typical power output of up to 270 W/m. Higher temperatures and power outputs can be achieved, contact Pentair for assistance. HAx mineral insulated (MI) heating cables are available as single and dual conductor construction and in a very wide range of resistances. The use of dual conductor heating cables can signiﬁcantly reduce total installed cost and simpliﬁes installation, in particular for small pipes and instrument tubing. The heating cables are offered as bulk cable as well as factory terminated heating units employing brazing and laser welding technology. The offering is completed with a full range of components for installation, connection and splicing of the heating cables. 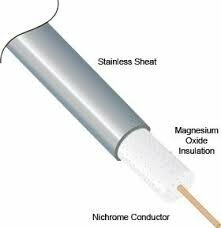 All cold lead cables can be used for up to 600 Vac and use copper conductors with a temperature coefﬁcient of 3.9 x 10-3 1/K. * For details on the different heating unit designs, refer to page 179. Delivery length of bulk cable on coil depends on type of resistance and is limited by max. coil length as indicated in the table on top. Factory terminated elements are limited by a max. weight of 50kg, however to ensure practical and safe on-site handling, it is strongly recommended to limit element lengths to 25 - 30kg. Not all resistances are standard items and as such may not be in stock. Contact Pentair to conﬁrm lead time. Pentair requires the use of a 30 mA residual current device to provide maximum safety and protection from ﬁre.